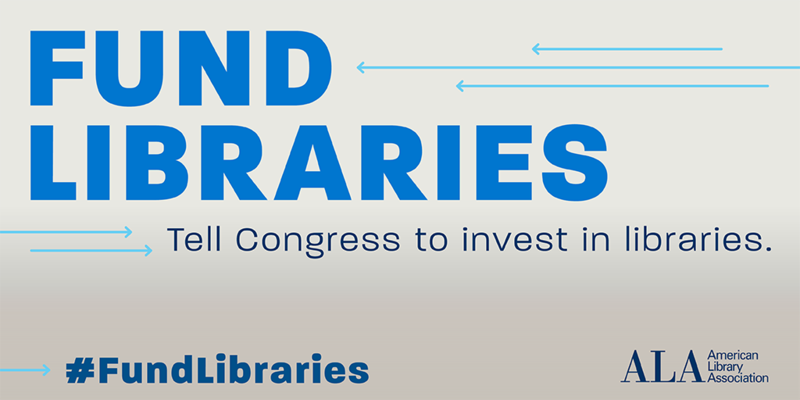 Ask Your Senators to #FundLibraries by April 5! The White House budget proposal for FY2020 has, for a third time, proposed elimination of federal funding for libraries. This year’s “Dear Appropriator” letters have finished in the House. We are now urging Senators to preserve more than $210 million in federal library funding. One letter asks members of the Senate Appropriations Committee to fully fund the Library Services and Technology Act (LSTA) and the other asks the Committee to fully fund the Innovative Approaches to Literacy (IAL) program. The more signatures we have, the better the chance that the appropriators will protect funding for LSTA and IAL programs. Senators Jack Reed (RI) and Susan Collins (ME) are leading this year’s LSTA and IAL letters and the deadline is April 5. Want to see if your representative has signed already? Check our appropriations letter tracker. Email your Senators now! As you may have heard, the White House has released its federal budget proposal for FY2020 and once again, they have proposed to eliminate the Institute of Museum and Library Services (IMLS). Libraries need your support now more than ever. ALA is calling on library advocates in every congressional district to contact their representative and ask them to support federal funding for libraries by cosigning “Dear Appropriator” letters to fund the Library Services and Technology Act (LSTA) and the Innovative Approaches to Literacy (IAL) program. The more signatures ALA gets on these letters, the more likely it is that funding for LSTA and IAL will be restored. The deadline for signatures is March 28. Learn more about ALA’s FY2020 #FundLibraries Campaign here. Also, be sure to visit ALA’s action center to contact your member of Congress and sign up to receive action alerts at strategic times as the campaign progresses. One of the most difficult moments of the month was observing my English Learners come to check out books with their classes and not be able to find anything they could read at the high school level. It broke my heart to see dejection on their faces. It did not matter that I myself could not understand the words they were saying; I could just see it. Students perform better academically in literature courses when they see themselves in the materials and simply enjoy independent reading more. While I had some titles of interest for my Latinx students topically, all of them were in English. I set out to add books to my school library collection to assist my Spanish-speaking students. To purchase fiction in Spanish, I first posted a request on Donors Choose (www.donorschoose.org) for just ten novels. 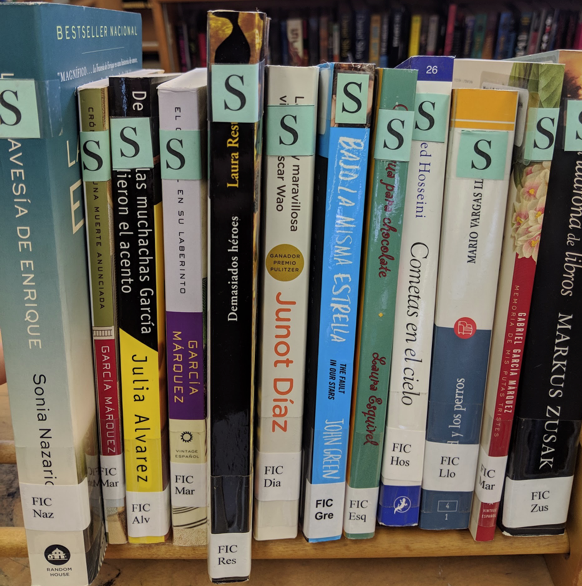 When the project was funded and the books arrived, I labeled each with a green S and shelved them above our fiction cases to aid new students trying to find them. After that success, I added another Donors Choose project to bring ten Spanish memoirs to West Haven High School, as all of our seniors must read a memoir. Sharing this story via social media has been a blessing in terms of the varied audience reached. Links to the story appeared on Facebook, Twitter, and Instagram and were shared numerous times by personal friends and professional connections. Books began appearing on my home front porch and in my school mailbox from all corners of the community, from a prominent defense attorney to a small Catholic Church to a representative of the Hispanic Nurses Association of a large local hospital. Our community’s support of literacy is invaluable, and as school librarians, we must be willing to advocate for it on behalf of our students. Jillian Woychowski is a School Library Media Specialist at West Haven High School and is a member of the AASL/ALSC/YALSA Interdivisional Committee on School-Public Library Cooperation. I am one of the lucky 2018 Teen Read Week grantees, and I need to give a huge THANK YOU shout out to YALSA and Dollar General for providing funds to help me make this an astronomically successful week (see what I did there?). I work in a middle school in central Virginia. We have about 1100 students and each year we struggle to meet the needs of both our high achieving students while balancing it with the more urgent need of reading scores on state tests. I think I helped with both this year! Students did not have school on the Monday of Teen Read Week due to a holiday. However, we began advertising our events with daily announcements, posters, and of course an eye-catching display as soon as you entered the library. We needed daily announcements so that students could sign up for the programs I offered. It may seem as if we have a captive audience, but many teachers are reluctant to allow students to leave their class for a library program due to the almighty state test preparation. Once a student signs up, I have to create passes to leave class, forward names to teachers who have them in class, get teacher permission and get approval from administration. For every program event. Fortunately, I can attest to the fact that the students LOVE to come to library programs and are willing to miss even their “fun” classes or lunch to attend. I started the challenge last year but this year I was able to really expand the program thanks to the Teen Read Week grant sponsored by Dollar General and YALSA. Last year, many students were not able to receive the prizes they earned but this year I made sure all students who completed the challenge received their prizes. This year’s program was different because I had more community involvement. In past years, I have worked alone and not really involved others. When I opened the doors up to the community, it made my program even better. I have established relationships and connections that have helped me to make a bigger impact. Because of the Teen Read Grant, I reached out to the manager of Dollar General. He was very supportive of the program and he was excited to be a part of our event. 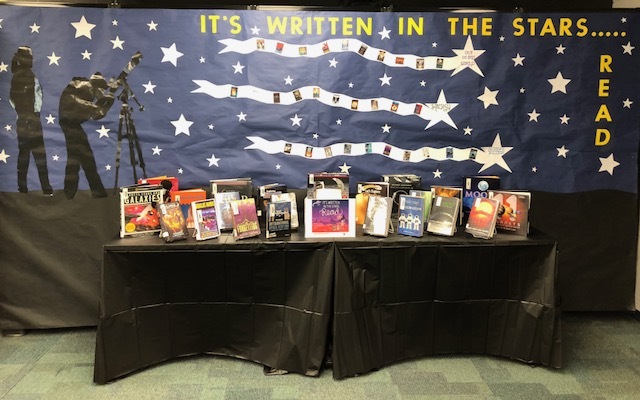 We at Montville Township Public Library were very grateful to be awarded the Teen Read Week Grant this year and used it to do a four program series relating to Constructed Languages in Science Fiction and Fantasy. First, a book discussion related to this concept, choosing books in which a constructed language is major part of the story, in our case, the invented languages of Christopher Paolini’s Alagaësia, Newspeak from the novel 1984, and the future English of Riddley Walker. Then, virtual guest lectures by Christopher Paolini, the author of Eragon, and David J. Peterson, the linguist for HBO’s Games of Thrones. Finally, we ended with a Conlanging Workshop devoted to creating new languages, using the rules of David J. Peterson’s The Art of Language Invention. Throughout, we touched on the theory of linguistic relativity, the idea that the structure of a language actually affects how each speaker thinks and views the world. Further, as attendees were introduced to the workings of myriad languages, they saw that things that seem obvious to English speakers are not necessarily the case. Over the four programs, attendees learned language and culture are intrinsically tied together, and were able to see its impact on a variety of different worldviews. The possibilities of language are vast, there is no set way to do things. For example, the attendees learned that English uses dummy pronouns, the ‘it’ in “It’s raining,” yet most languages do not work this way, simply opting for their word for ‘raining’ (Afterall, what is the ‘it’ referring to?). Similarly, I showed them an example of a constructed language that didn’t even use verbs. They learned that the word ‘butterfly’ used to be ‘flutterby’ and someone made a mistake hundreds of years ago that stuck. Not only is that an amazing fact, but the realization that most words have stories behind their formation was of great interest to them as well. Lastly, learning all the ways that one’s language affects their worldview and behavior, from speakers of tenseless language being healthier and more financially stable, to speakers of languages that used cardinal directions instead of left and right being able to navigate better, was especially interesting to them. Personally, I find language fascinating, and I knew many of our teenage patrons thought the same. But what I found in doing these programs is the widespread appeal of the topic of language. People I would’ve never guessed attended some of the programs. Some patrons, for example, who had only ever attended our Super Smash Bros. Tournaments, eagerly attended the Conlanging Workshop. People who had no real interest wound up attending out of curiosity or to accompany a friend, and left amazed and intrigued. To see them speechless as they learned each mind blowing linguistic fact was wonderful. Language is something so natural to us, so ubiquitous, that we often pay it no mind. But to see behind the curtains, to see the impact it has on us and we on it, is where I think the appeal lies. The newfound interest could lead to them investigating further, to possibly delving into related topics of psychology, philosophy, education, language teaching, sociology, anthropology, computer science, and even artificial intelligence. If a library is looking for an educational opportunity for its teenage patrons, language is an excellent starting point. Jeff Cupo is the Young Adult/Community Services Librarian at Montville Township Public Library. By Guest Blog October 25, 2018 October 21, 2018 Funding, Future Ready, Interactions with Teens, Learning Environments, Learning Experiences, Literacies, YALSA Info. Greetings from the Rancho Cucamonga Public Library in Rancho Cucamonga, CA! We are honored to receive this year’s Teen Read Week Grant and are excited to share our plans for our upcoming programs. 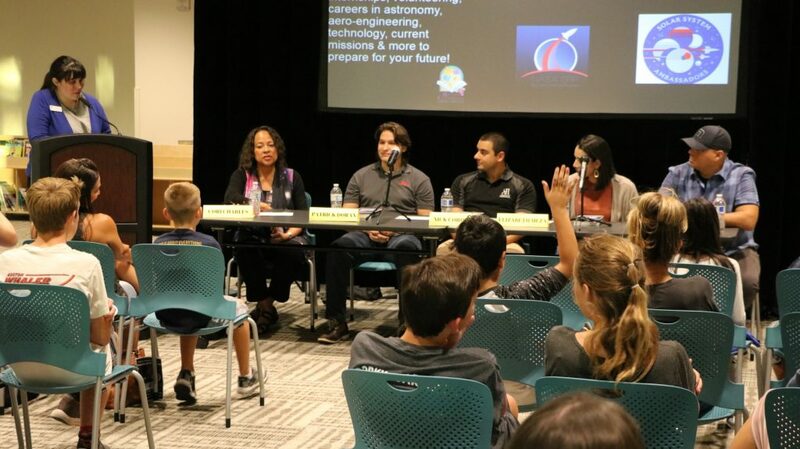 Following this year’s Teen Read Week theme “It’s Written in the Stars… READ,” our programs are centered around an outer space theme. We also chose the book Railhead by Philip Reeve (which is set in several galaxies) to be our focal point. With the help of the grant, we will be able to purchase several copies of Railhead, which will be distributed a month prior to our programs to our teens. The goal here is to provide our teens with the reading material so they can discuss and analyze the novel while relating it to their hands-on experiences during the programs. 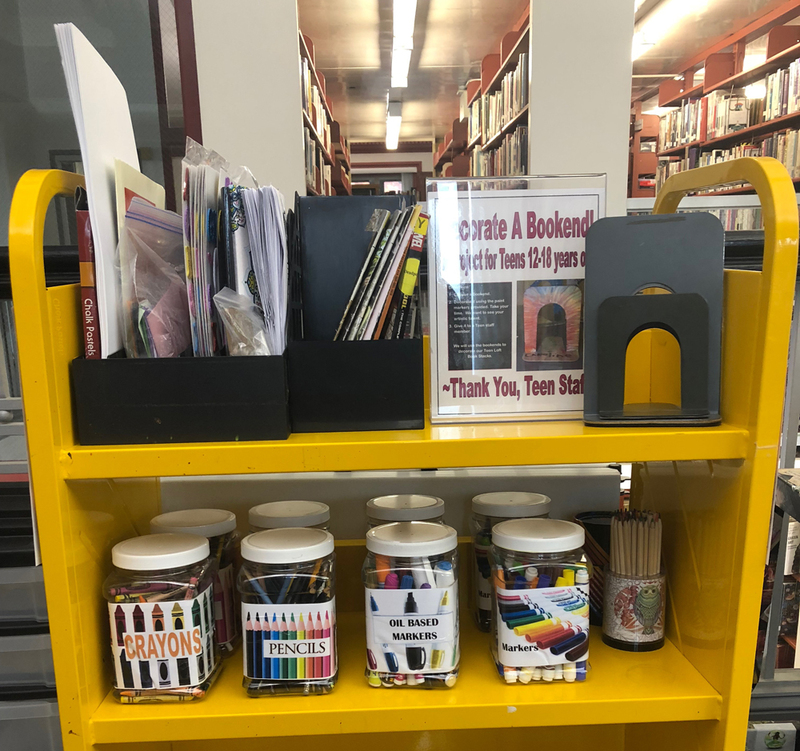 The Johnson City Public Library (Johnson City, TN) began a new teen program called Stories to Service after receiving the YALSA Symposium Programming Challenge Award in 2018. 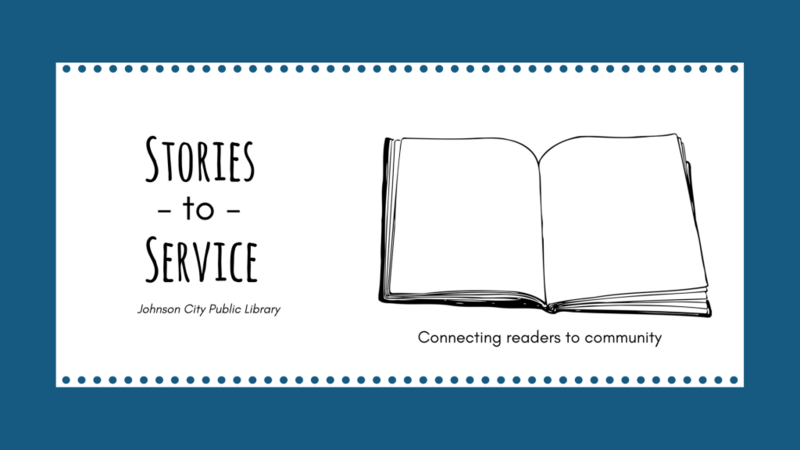 Stories to Service is a teen volunteer program that combines literature with volunteerism through service projects and book clubs. The projects are both planned and implemented by teen volunteers between ages 12-18. Participants will gather to decide what service area they would like to focus on. Then the participants will read a book centered on their selected topic, discuss it together, and complete a project related to the book. JCPL’s Teen Services Manager, Katelyn Wolfe, drew inspiration for this program from various discussions at the YALSA Symposium in November 2017, including presentations on teen volunteers and an author panel discussing Rudine Sims Bishop’s essay Windows, Mirrors, and Sliding Glass Doors. Her goal was to create a program that accommodated the large number of teens who needed volunteer hours but also gave them an opportunity to connect with their community in new ways. Upon returning to the library, Katelyn brought the idea to the Teen Advisory Board members, who were immediately on board and began brain-storming possible ideas. Apply Now: New Innovation in Teen Services Award! The YALSA Board is excited to announce a new member award – the Innovation in Teen Services Award. 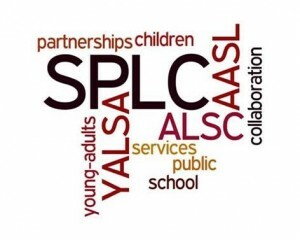 The award, funded by Friends of YALSA (FOY), was established in 2018 by the YALSA Board to recognize a member who has developed an innovative program in their library that has benefited teens in their community and that illustrates YALSA’s vision for teen services as outlined in the report: “The Future of Library Services for and with Teens: A Call to Action” and “Teen Services Competencies for Library Staff.” Innovation includes leveraging creative thinking, problem solving, and/or identifying novel solutions to challenges. Innovation often involves risk-taking. Must be a current personal member of ALA &YALSA. Must work for and with teens in a library setting. More about the award criteria and application materials can be found here. Submit an application by December 1. If you have any questions please contact Letitia Smith at lsmith@ala.org or at: 800/545-2433 x 4390. The Board is looking forward to learning about the wonderful innovative projects our members are engaged in! Thanks for all you do for teens and for YALSA!